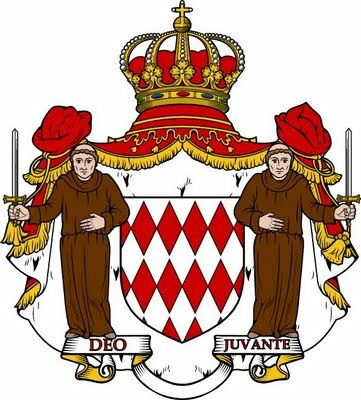 The first lord of Monaco was Carlo Grimaldi in 1341, member of a Genoan family that traced its ancestry from Otto Canella, who was consul of this republic in 1133. 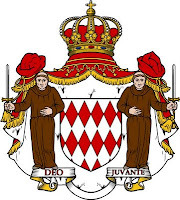 The sovereignty of Monaco was confirmed several times by the kings of France. Honoré II (1597-1662) used since 1612 the princely title. King Louis XIII of France gave him in 1641 the duchy of Valentinois. The princely title was confirmed by France in 1688. The Grimaldi dynasty died out in the male line with Antoine I (1661-1731). His daughter Louise Hippolyte married Jacques de Goyon de Matignon, who took the name Grimaldi at his wedding in 1715. Their last male descendant was Louis II (1870-1949). For a while the Germans Urachs were in line for the inheritance, but Louis legitimized his daughter Charlotte, who subsequently married count Pierre de Polignac. Their son Rainier III succeeded his grandfather. The Polignacs trace their ancestry to a Bertrand de Chalencon, who was mentioned in 1179. His descendant Guillaume III Baron de Chalencon married around 1349 Valperge de Polignac and their son Armand became Vicomte de Polignac. 97. Marie Christine Blum * Triglitz 1810 + Kingwilliamstown 25-12-1896; Dr van Joachim B.